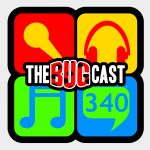 This week on The Bugcast: we talk about Spotify and the BBC Music awards, plus we play 8 great tracks of independent and Creative Commons music! The next live show will be episode 341, which will be broadcast live in the chatroom on Friday 19 December 2014 at 21:30 UK time (GMT/UTC). There will be no show on Friday 26 December, the next show after that will be on Friday 2 January 2014. Hey Bug Cast team! I just discovered your podcast and love it. I had no idea you even covered one of our songs last December, and we appreciate it. Just wanted to say thanks and love the show. All the Best!